The most important advantage of the electromagnetic technology compared to the RF Technology is that it can be applied in the HiFi / Audio department. More positive features are: the vast selection of tags, the possibility of investing the adhesive tags with a barcode as well as the extremely thin and narrow metal-stripe tags, which are also suitable for source tagging. The safety tags are fully reusable. EM500 is a system that works with electromagnetic technology. 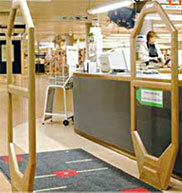 It was specially designed for libraries and bookstores. EM500 is also available in the 3 antenna version thus covering 2 passages. 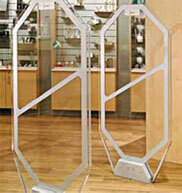 EM 700 is an electromagnetic retail security system in smart acrylic design. It is intended primarily for libraries and special sales areas. EM700 is also available in the 3 antenna version thus covering 2 passages..